The English lore given is not official. When your "Marincess" Link Monster destroys an opponent's monster by battle: Inflict damage to your opponent equal to the Link Rating of that monster you control x 400, then, if you control a Link-2 or higher "Marincess" monster and the opponent's destroyed monster is a Link Monster, inflict damage to your opponent equal to the destroyed monster's Link Rating x 500. 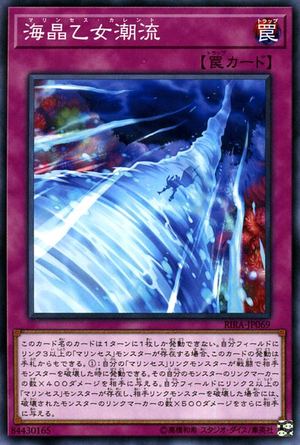 If you control a Link-3 or higher "Marincess" monster, you can activate this card from your hand. You can only activate 1 "Marincess Current" per turn. This page was last edited on 13 April 2019, at 12:31.